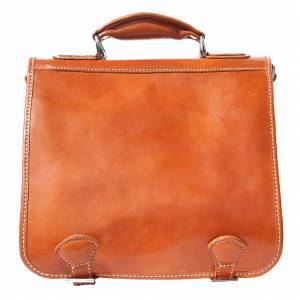 Leather briefcase made with genuine calf leather. Soft structure. Fold-over front with twist lock closure. Leather handle. Back compartment with zip. Adjustable and detachable. leather shoulder strap. Inside: two compartments. Business card holder, mobile phone holder, pen holder. Handmade in Florence, Italy. Very useful for businessmen. Exactly what I wanted,beautiful craftsmanship a lovely briefcase.